This December marks the centennial of radio licensing and regulation in the United States and the December issue of CQ starts with a look back at the airwaves in those early days of wireless and the conditions that led to the Radio Act of 1912. Next, in honor of Pearl Harbor Day, we have a look at "Mighty Mo and the Battleship Missouri Amateur Radio Club," by Woody Hester, WD9F. The battleship is now a museum ship "standing guard" over the USS Arizona memorial in Pearl Harbor. We also have the results of the 2012 CQ World Wide DX 160 Meter Contests. The top scorers included: CW - VY2ZM, LY2IJ, VE3MGY, PJ2T (K8ND op. ), E7DX (9A1TT, 9A9R, E70R, E70T, E74IW, E76C, E77DX, E77WM, ops. ); SSB - VY2ZM (K6AAX, op. ), S57DX, K5RX, CT3DL, S52OP (S51V, S52OP, S59A, ops. ); SSB/CW Combined - K3ZM, S52OP. We also have the rules for the 2013 CQ DX Marathon -- remember, the 2012 Marathon ends on December 31 and logs must be submitted by January 15, 2013 (This is a new deadline). The recommended Excel® spreadsheet for reporting may be downloaded from www.dxmarathon.com. We also have our annual index in this issue, for quick reference to every article that appeared in CQ during 2012. An updated Master Index from 1980-2012 will be posted here on our website in the near future. Among December's columns, "Math's Notes" editor Irwin Math, WA2NDM, asks whether we are becoming a throw-away society; Public Service Editor Richard Fisher, KI6SN, provides a window into "Resilience, Hope, Reorganization and Preparation" with stories from New Orleans and Army MARS; and "Riley's Ramblings" editor Riley Hollingsworth, K4ZDH, says "You Gotta See This!" about the internet-TV show, "Ham Nation." 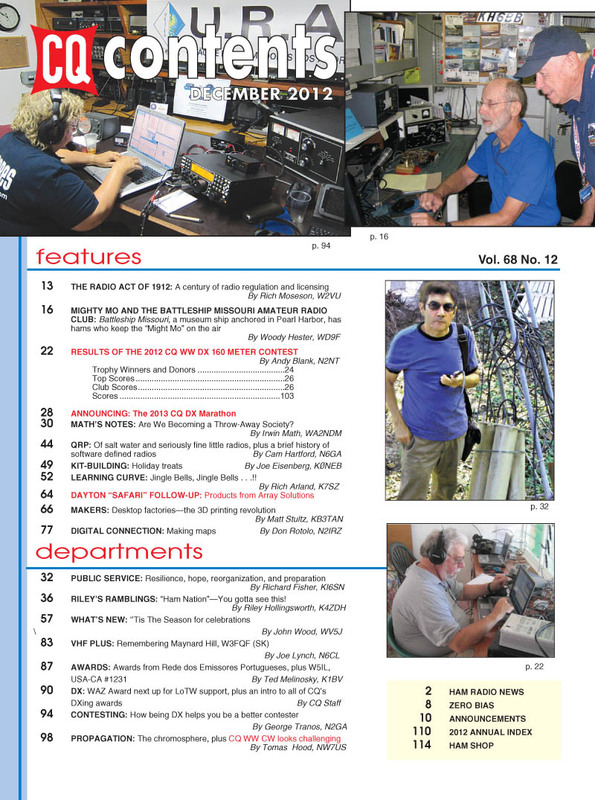 QRP Editor Cam Hartford, N6GA, writes "Of Salt Water and Seriously Fine Little Radios," Kit-Building Editor Joe Eisenberg, K0NEB, offers up some holiday treats for builders, "Learning Curve" editor Rich Arland, K7SZ, has some gift ideas for your emergency communications "Go Kit," and New Products Editor John Wood, WV5J, looks at MFJ's 40th anniversary celebration as well as some holiday ham radio goodies. "Makers" editor Matt Stultz, KB3TAN, offers an introduction to 3D printers and how they can help your ham shack; Digital Editor Don Rotolo, N2IRZ, looks at making customized maps on the internet, and VHF Editor Joe Lynch, N6CL, remembers radio/control flying pioneer Maynard Hill, W3FQF, who became a Silent Key earlier this year. 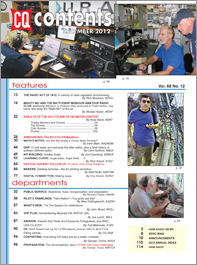 Awards Editor Ted Melinosky, K1BV, introduces a series of awards from Portugal's national ham radio organization, and this month's DX column announces that the Worked All Zones (WAZ) award will be next CQ award to be supported by the ARRL's Logbook of the World system. Contesting Editor George Tranos, N2GA, writes about how "being DX" can help you to be a better contester, and Propagation Editor Tomas Hood, NW7US, looks (not directly!) at the sun's chromosphere. Tomas also predicts that conditions for the CW weekend of the CQ World Wide DX Contest at the end of November will be good but "challenging." That's a brief look at what's coming up in the December issue of CQ magazine. For information on becoming a CQ subscriber, click here. Happy holidays from all of us at CQ! 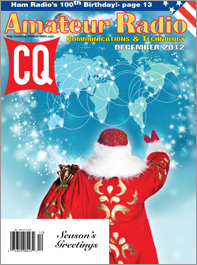 Zero Bias - "A Century of 'Open Source' Electronics"
On the Cover: Happy Holidays from CQ and Santa to hams all around the world!